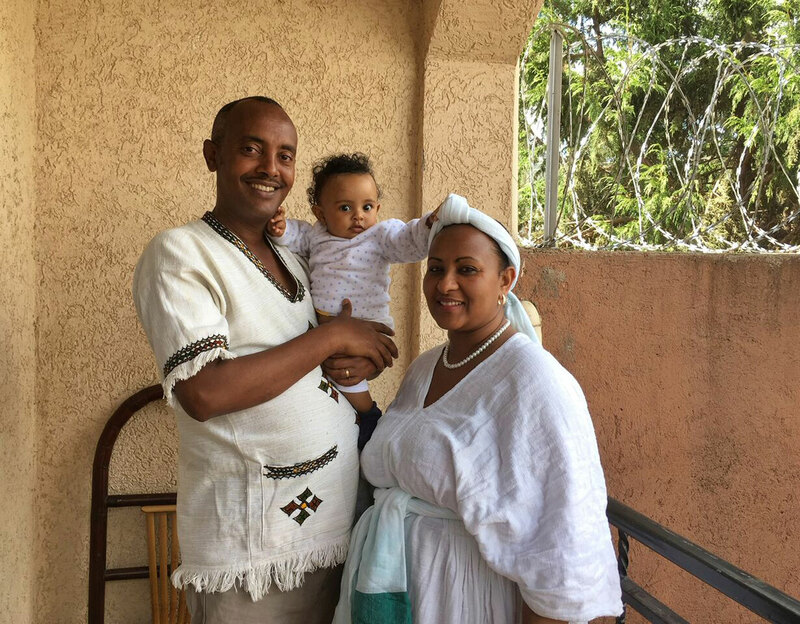 Daniel and his wife Tigist are from the Oromia region of Ethiopia but love to cook dishes from around the country, so prepare to be served pan-Ethiopian cuisine. Tigist learned to cook helping her mother around the house as a child, and ran her own kitchen after marrying Daniel. Daniel speaks perfect English and enjoys discussing diverse subjects from food and history to politics. Tigist is less confident speaking English but is incredibly friendly - together they make a great team. Daniel has a master's degree in social anthropology and is a tourism professional - he has led trips around Ethiopia for over a decade. He enjoys meeting people from different cultural backgrounds and sharing his rich heritage with them. They are blessed with three handsome boys who may join you during your experience if it's on a weekend. 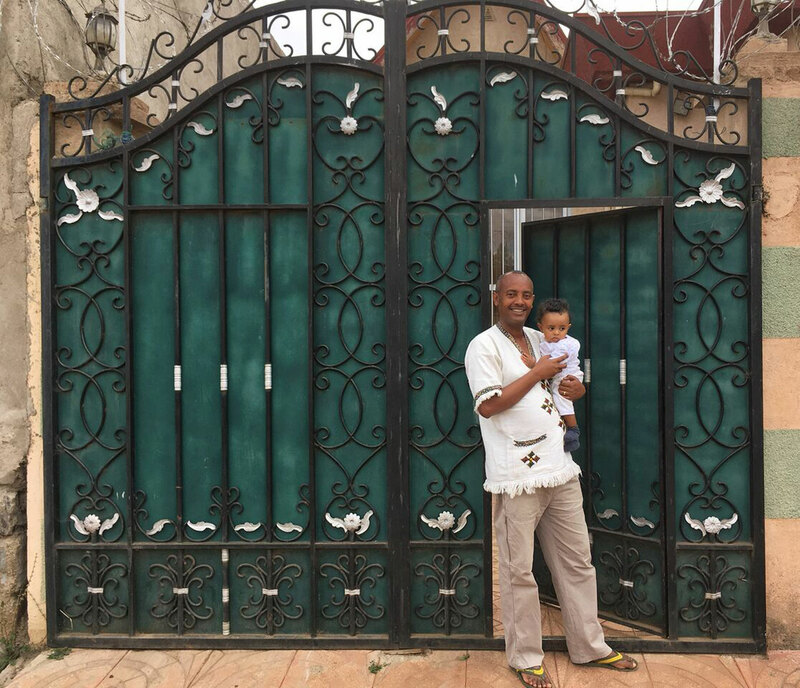 Please note that on days that Daniel is traveling, his friend and business partner Yadassa will host you along with Daniel's wife, Tigist at their home. 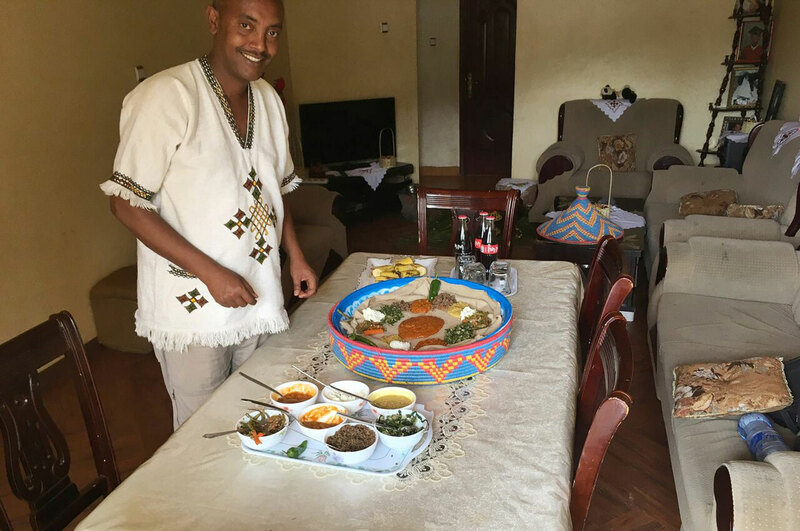 In-home meal: (1-6 guests) Daniel and Tigist’s home is in the outskirts of Addis Ababa, a neighborhood not frequented by tourists that is calmer and greener than central Addis Ababa. Their home is comfortable, clean and homey, decorated with pictures of their three boys, who you may meet if your experience takes place during the evening or on the weekend. 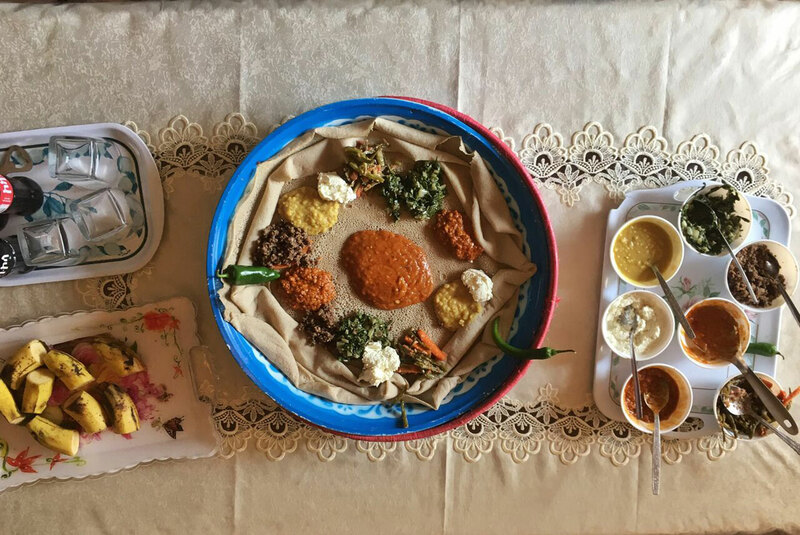 Ethiopian cuisine is comprised of a variety of spices in its wots (stews) and tibs (curry), making the cuisine hot and piquant. 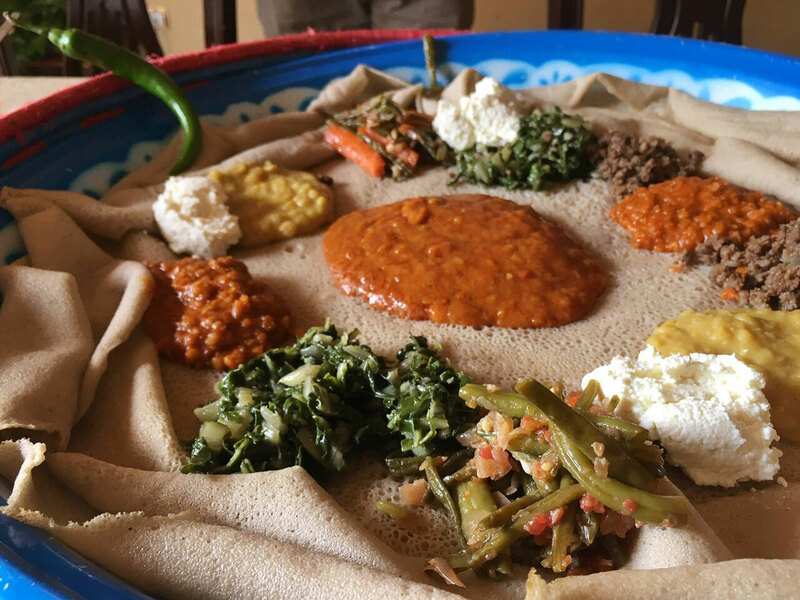 You will eat as Ethiopians do, from communal plates lined with injera, a traditional fermented bread. Injera acts like an edible plate with other dishes served on top of it. 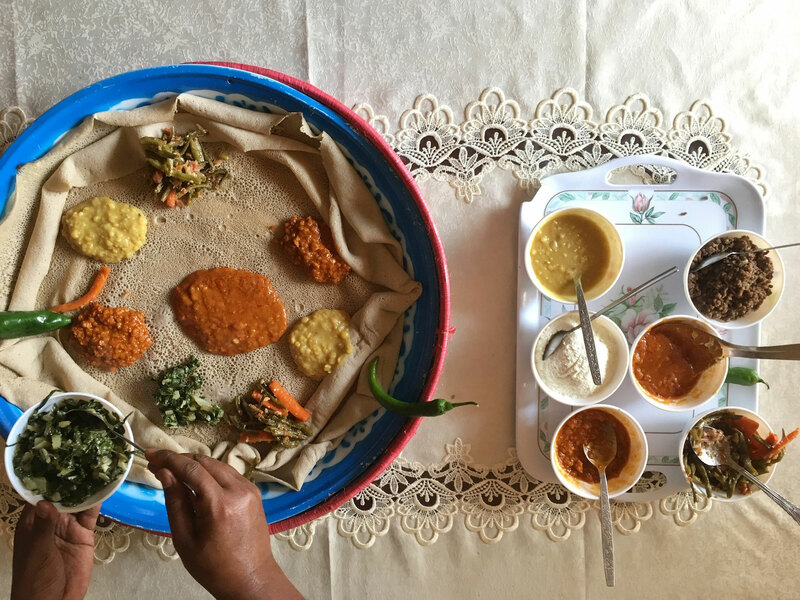 The juices soak into the injera, which diners tear off into morsels to eat and even feed each other in a gesture called gursha that is meant to strengthen bonds. Teff flour is used to make the injera bread, which is soft, spongy and perfect to mop up the delicious gravies that soak through it. Your meal will be served family style with injera served alongside an assortment of meat, fish, vegetables and lentils. You will sit around the injera and enjoy your meal from one single platter. 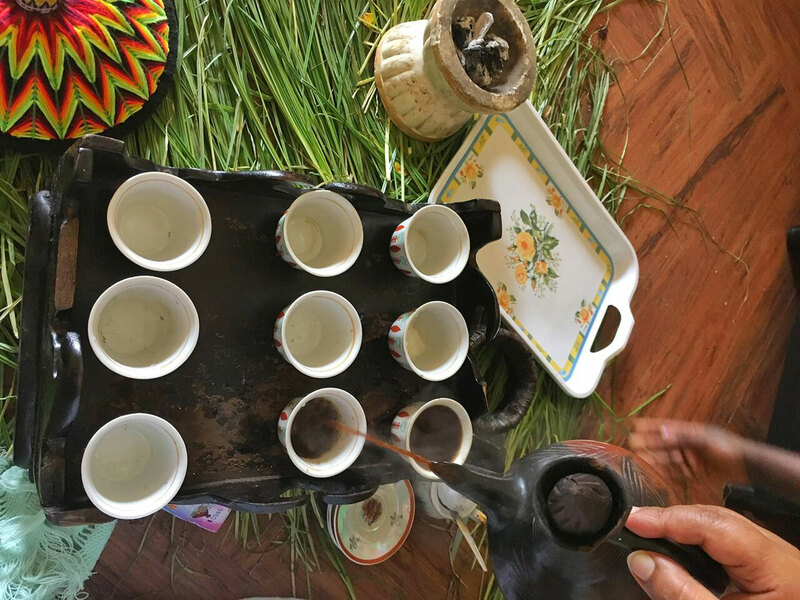 As Ethiopia is the birth place of coffee, you will enjoy a traditional coffee ceremony after your meal. Cooking experience: (1-6 guests) Your cooking class will take place in Daniel and Tigist’s home kitchen. 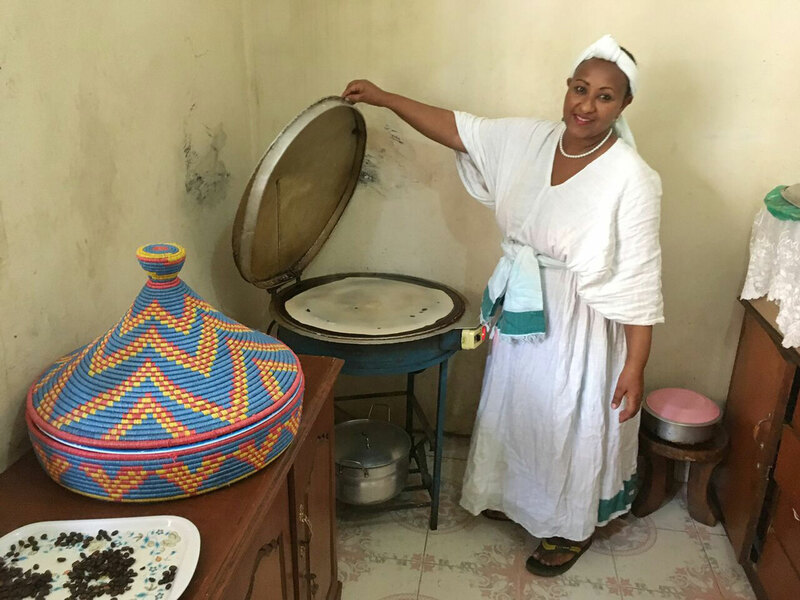 During your two hour class, Tigist will show you how to make a traditional Ethiopian dish as well as how to pour and cook the perfect injera. You might learn to make shiro (chickpea or broad bean stew) or tibs (stir-fried meat with vegetables and spices) in addition to injera. You will also learn to roast coffee beans. If you're interested in learning to make an additional dish, include it in the "notes" section of your booking - please note that it will extend the cooking time. Market visit: (1-6 guests) After you meet your host at his home, he will take you to the Keta/Asco market, a 15-20 minute walk from his home. Here you will be introduced to local ingredients that you will use in your cooking class later. The market is a daily local market known for its spices, cereals, vegetables and other industrial materials. While the market is open on all days, Wednesdays and Saturdays are especially good for visits. Saturday is considered market day all over the country and the market teems with life and people. Your market tour lasts about an hour. 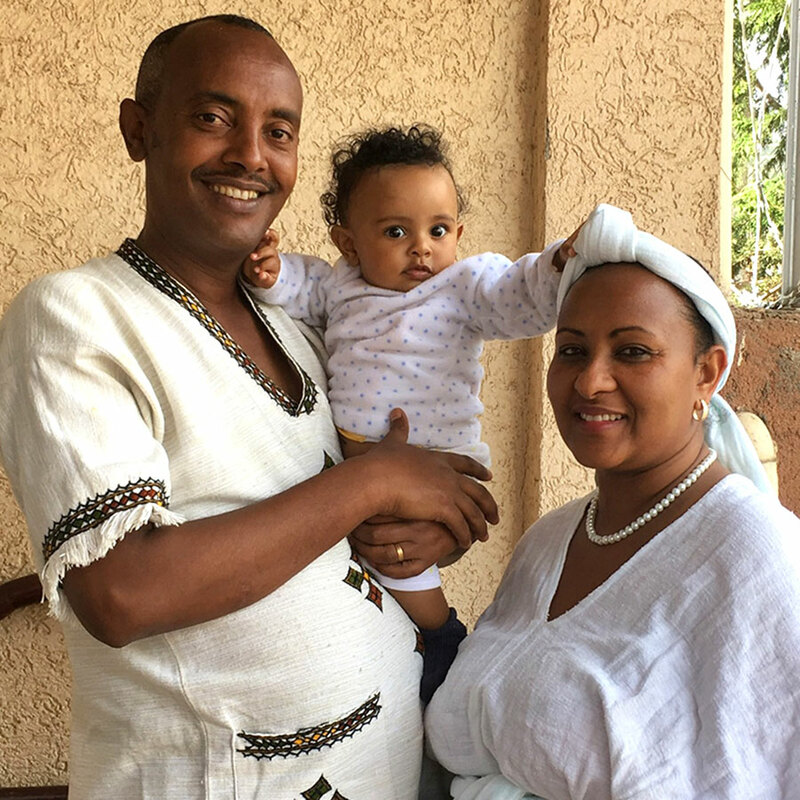 Notes: Daniel’s home is in the outskirts of Addis Ababa and about 25 km from the airport. Since public transportation is not very convenient and there are no clear postal addresses in Ethiopia, Daniel prefers arranging transport for you. He is happy to offer hotel pick up and drop off for an additional cost. If you would like this option please select "Yes" to transportation in the booking form. Daniel and good family were great hosts and teachers. We enjoyed meeting them and cooking together, and the food was delicious. They were able to do a vegetarian meal for us. My only issue was that it's quite expensive to reach there by taxi from the middle of Addis. My partner and I took the cooking class with Daniel and Tigist the last night of our trip. It was the perfect note to end on! Daniel picked us up at our hotel and took us back to his home for the class. We met his family and then started the class in the kitchen. Tigist showed us each step of making the base that is not only for shiro but most Ethiopian dishes. 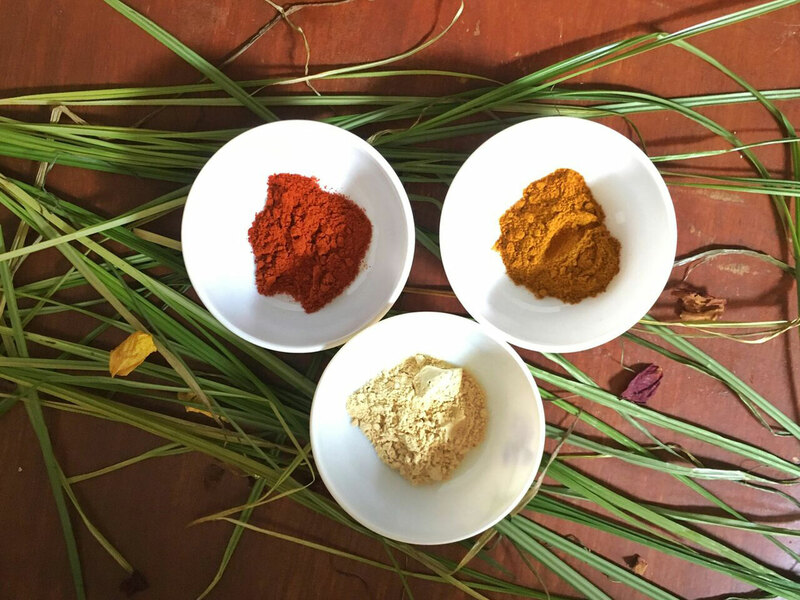 They both answered our many questions about the berbere and chickpea flour (both are not straight ingredients, but rather home blends they make!). After making the shiro, we moved into the next room, where the injera batter and machine is kept. It was much easier to watch Tigist pour the injera than do it ourselves, but fun nonetheless! 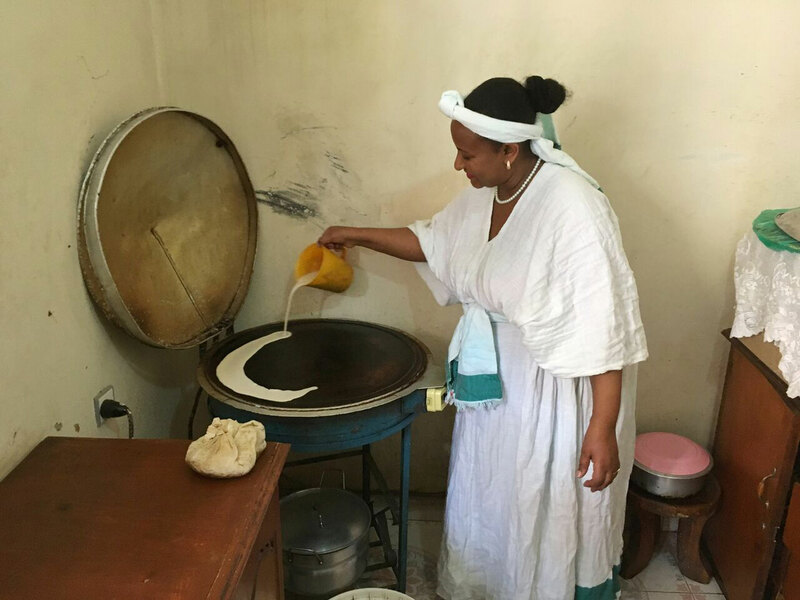 Fresh, warm injera is delicious, though for meals it's typically served cold as it's been made in batches. We made several injera, then it was time to warm up the other dishes they had pre-prepared for us. Then, to eat! What a delicious meal, wow! We tried 6 different dishes, all of which were really savory and enjoyable. Afterwards, we learned the traditional way to roast coffee beans and do the coffee ceremony. I must say it's a process, but also, I do not drink coffee at all, and yet LOVED this experience and the coffee itself. Delicious. While Tigist was roasting and making coffee, we chatted easily with Daniel about his work, traveling Ethiopia and other parts of Africa, history and so many other topics. It was an easy way to spend a Sunday afternoon, and we left full, happy and smiling. A fantastic way to come close to Ethiopian culture and tradition with great flavours. Absolutely great experience!! 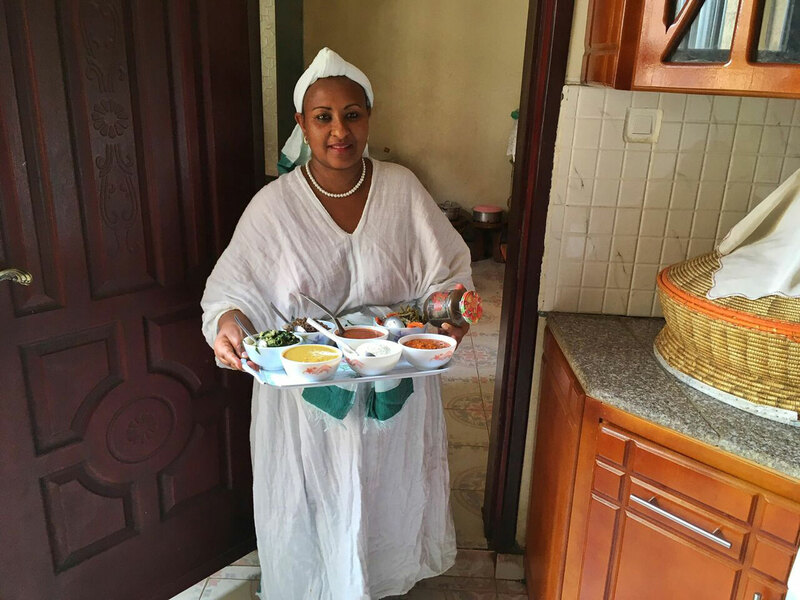 A great way to experience Ethiopian cuisine and traditions. This was the highlight of our trip. The farmers market was fascinating but being in a home and sharing a meal and conversation was the best! Without a chance to visit a local I think we would have missed a big part of the culture. We thoroughly enjoyed the cooking and eating! A great introduction to a lovely country and its delicious food. I am just back from my first trip to Ethiopia and have to write about one of the true highlights of our trip. Several friends and I enjoyed a Sunday cooking class and afternoon meal hosted by the wonderful Daniel Ademe Tirfe, his wife Tigist, and their three engaging children. We all have heard that in order to get the best of a local cuisine, you've got to eat in someone's home....well, this was the answer. Daniel picked us up at our hotel, and brought us to his home on the outskirts of Addis Ababa where we got to watch and help Tigist prepare the Shiro for our meal; using chickpea powder, onions, garlic and a combination of spices. We also discussed the variations of stews, wots and the spices - including the flavorful berbere chili popular in Ethiopian cuisine. Tigist then walked us all through the preparation of Injera talking about the teff (the grain used), the fermentation, and the consistency for a perfect injera. We then each had the chance to make one ourselves - none of ours came our quite as good as Tigist's but we had a great time laughing at our attempts. When the meal was ready we sat around the table enjoying every single bite. It was absolutely delicious. As important as the great food, we had great conversation too. Daniel took his time to answer all of our questions, culinary, current events, history.....it was a wonderful exchange of culture over a delicious table of food. Following lunch, the coffee was washed roasted, pounded and prepare for us to enjoy. 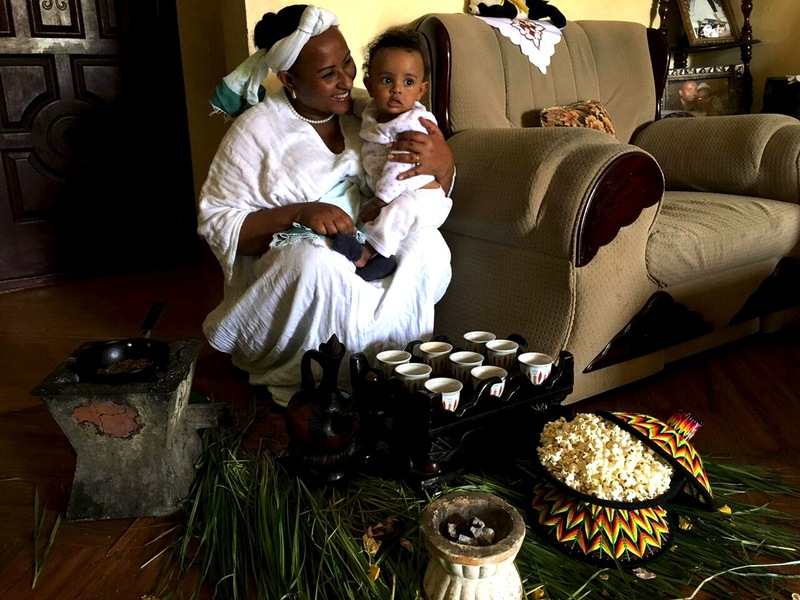 I just feel like we had a very unique and special opportunity to witness and join in the life of a family living in Addis - that have so generously opened their home to welcome 'strangers' curious of their food and culture. Daniel and his family made us feel completely welcome and I cannot thank them enough. Without a doubt it was a perfect day spent over the stove and the table. I look forward to another visit. Had a lovely time at Daniel's home meeting his wife and three sons. His wife taught me how to make shiro, and then we cooked a few injera breads together. Afterwards, we ate a beyaynetu and had a traditional coffee ceremony. The drive to Daniel's home is a good chance to see a local neighbourhood. Having booked a three-day layover in Addis Ababa, we began a search for what to do while there. We both love cooking, eating and meeting new people. 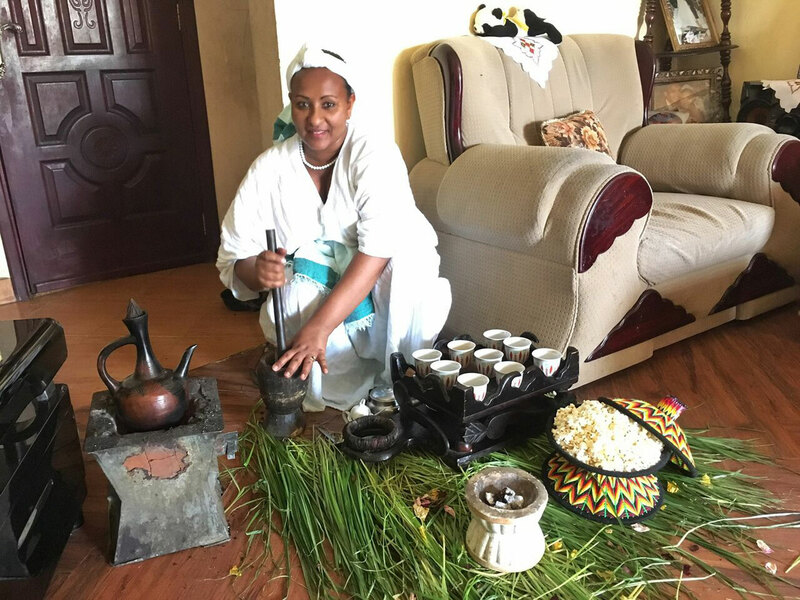 The opportunity to help prepare and eat an authentic Ethiopian dinner in the home of a local family seemed perfect. We had no idea how perfect. Daniel and Tigist and their three boys are wonderful hosts. Daniel and Tigist are very comfortable in English (as is their 12-year-old son), knowledgeable on a wide range of topics and, oh yeah, very good cooks. 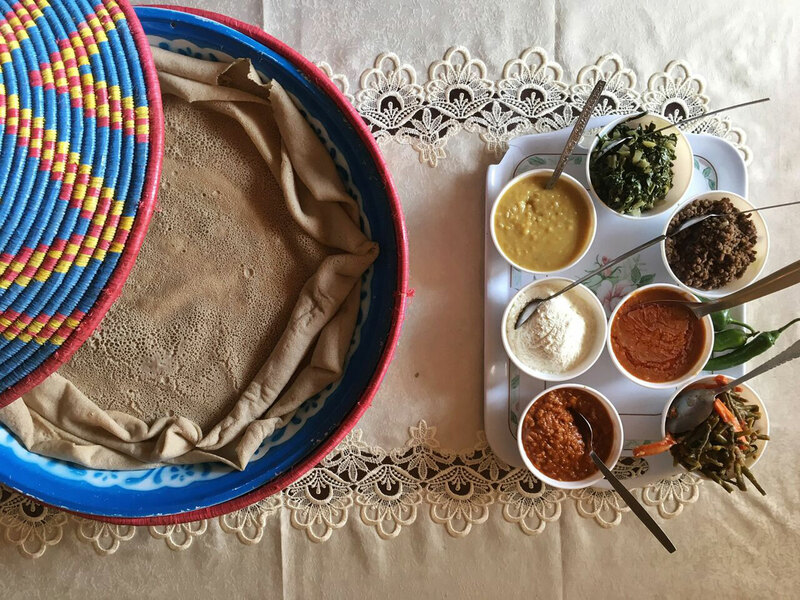 Over the course of the afternoon, we helped pour the batter and bake the injera, prepare the shiro (the base sauce for many dishes), then assemble it all for a dinner enjoyed from a common platter by hand. After dinner, Tigist showed us how to wash, roast (on a charcoal burner) and grind (using a large mortar and pestle) raw sundried coffee beans. 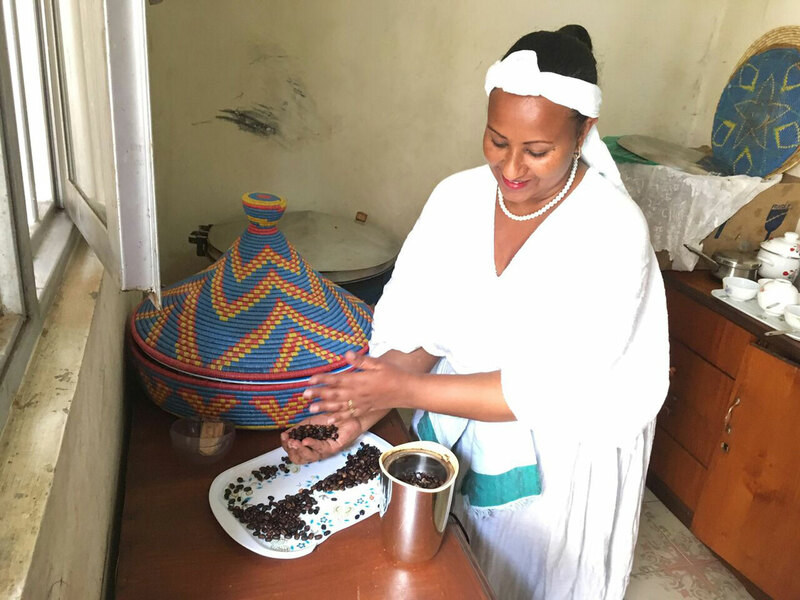 From these she prepared perfect cups of rich strong Ethiopian coffee. Our conversation over coffee then capped our perfect Ethiopian evening. If you happen to be in Addis Ababa, this is an experience not to be missed. Daniel, his wife and children were such a delight! They were very accommodating from the moment I arrived in Addis Ababa. From helping me visit a museum to inviting me into their home to prepare and eat the food, it was a wonderful day! They were extremely personable and fun, and the food was INCREDIBLE! I would highly recommend this market tour and cooking class to anyone visiting Addis Ababa -- you won't regret it one bit! Had an amazing afternoon with Daniel, Tigist, Yadessa and their familiy. They did not only share recipes but also a lot of insights on Ethiopia. Definitely recommended. Our evening with Daniel and his family was fabulous! They were patient, well informed and gracious and the food (and coffee) was wonderful. I am happy to recommend this experience to anyone traveling to Addis Ababa! It was a genuine and wonderful afternoon and night with Daniel and his family! We very much enjoyed his personal service and attendance to our individual family. It was so nice to visit a small market, prepare some of the food together with him and Tigist and eat the tasty food together. We have travelled a lot and to be received and hosted in the way Daniel did towards our family is truly rare. 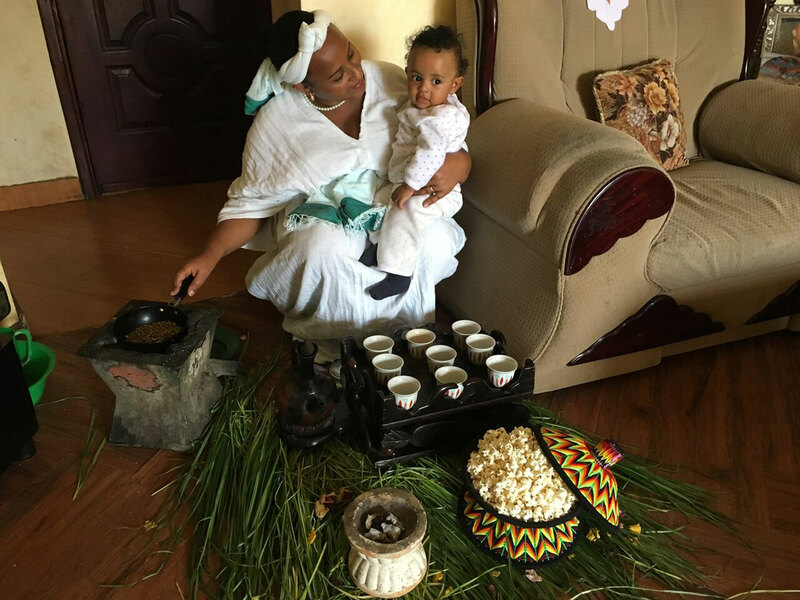 We had the chance to really experience authentic Ethiopia thanks to his family! Further, we got the opportunity to discuss political as well as social matters and all sorts of other issues with some one with great insight. We would absolutely recommend this experience to others!